Finding that large cottage that can accommodate a group of twelve people and has a swimming pool attached is not easy. Cottages with their own pools cost more to rent than those without. At least with a large group, the cost of the rental can be shared between all guests. 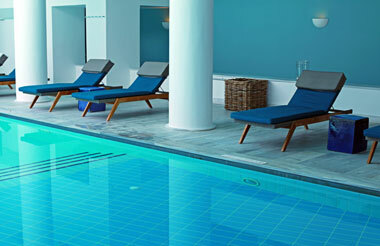 The presence of a swimming pool adds a huge dimension of simple entertainment and fun to any holiday. Throw in a beach ball and a couple of inflatables and suddenly everyone is a child again. Holiday accommodation with a swimming pool can be highly entertaining and even educational for kids. It could be the ideal opportunity to teach children to swim at your pace and provide a crash course over the duration of the holiday. People have concerns when there are very small children about. It is wise to take precautions to ensure that children do not accidentally wander into the pool area. Small children often have no fear of water and will jump in even if adults are not around. An indoor pool is usually accessed via a lockable door. An outdoor pool in the garden may be more accessible. It would pay to obtain details of access and safety consideration before booking if young children are to be part of the group. Renting a self-catering property with its own swimming pool means that safety is your own responsibility and although the notion of a party around the pool might sound like a great idea, alcohol and swimming pools are not a good mix. Throwing people in the pool might sound like fun but not everyone can swim and many pools have deep end where it is not possible to stand up with one’s head above the water. If you do go ahead and plan a party by the pool with your friends, plastic drinking glasses are safer than glass. Make sure that you know who the non swimmers are and also who has lifesaving qualifications. Best to be prepared and informed in advance.